In our commitment to help you find products that actually deliver, we’re rounding up the best moisturizer for oily skin in this list. This review is the outcome of more than 17 hours of working with around 20 different brands– sorting them based on their efficiency in controlling oil, ingredients and added skin benefits. ​For a mattifying moisturizer that can last the whole day, La Roche-Posay Effaclar Mat Oil-Free Mattifying Moisturizer is a product worth looking for. It works to refine pores and keep shine and oil at bay without being too harsh on your skin. Clinique Dramatically Different Moisturising Gel has a light formulation that gets absorbed by the skin real quick. It comes with no fragrance and oil to ensure you won't look and feel greasy by midday. ​If you have zones of oily and dry patches, Murad Skin Perfecting Lotion can definitely help. It has ingredients that can tighten your pores while allowing your skin to keep its natural radiance. Sebamed Clear Face Care Gel is packed with lots of great skin-friendly ingredients to control oil and help improve your skin's moisture. Although it does come without fragrance and emulsifiers, it still has the potential to cause acne. La Roche-Posay Effaclar Mat Oil-Free Mattifying Moisturizer is formulated for two things: refine your pores and control oil. It leaves a matte finish while still giving your skin enough moisture to keep its glow. For oily skin, this is essential as stripping the skin of its natural oils will only make it produce more oil. The product actually amazes me. Although it is a moisturizer, it actually contains a micro-exfoliant to help reveal healthier skin and for oil control, this one has Sebulyse. A little goes a long way for this product. In fact, you’ll need just a pea-sized amount for your entire face. Take note, however, that the product comes in a small packaging so it’s still possible to quickly use it all up. The moisturizer applies smoothly on the skin which makes it a great makeup base. It comes with a gel-like texture that gets easily absorbed by the skin. Clinique Dramatically Different Moisturising Gel is packed in a pump bottle which I find nice. Aside from that it’s more hygienic, you won’t have issues getting just enough product for your face. The moisturizer has a gel formulation that isn’t oily or heavy on the skin. In fact, it feels silky and light. It gets absorbed quickly and leaves a nice cooling sensation on the skin- without the greasy feel. There’s no strong fragrance and the chances of it breaking you out or causing allergies are minimal. This moisturizer is actually a part of a skin care system from Clinique. You can do away with this product and skip the rest if you are just looking for a good moisturizer. It is a bit pricey but considering that you’ll only need a small amount, one bottle can probably last you for several months. One thing I didn’t like much about this moisturizer is that it doesn’t contain as much potent antioxidants as other Clinique items. However, this doesn’t mean that this one falls short when it comes to results. One of the purposes of Murad Skin Perfecting Lotion is to control oil production while improving your skin’s hydration and texture. If you’ve been struggling to find a product that can provide all three things, this is the one you’ve been looking for. The product has queen of meadow extract to tighten your pores. It is also loaded with retinol and soy flour to make your skin more youthful and elastic. I find its ability to control oil while allowing your skin to show a healthy radiance impressive since most moisturizers for oily skin can make the skin look dull. It doesn’t come with SPF so make sure that you use a separate one to keep your skin protected during day time. Another issue you may encounter with this product is that it isn’t guaranteed to be safe for sensitive skin. There are people who experience breakouts after adding this lotion to their routine. Sebamed Clear Face Care Gel contains 50 ml of active natural moisturizers. It doesn’t contain oils and even emulsifiers. What stands out in this product is its great list of ingredients. For one, it has hyaluronic acid to seal in moisture to your skin. It also has panthenol to make your skin smoothe and elastic. It has a pH level that’s within the range of your skin’s own pH so its natural barriers don’t get disrupted- a condition that can aggravate your oily skin more. Its packaging is a squeeze tube which can slightly affect the way you dispense the product, particularly during the last few drops. However, I find it hygienic since you won’t be exposing what’s inside the tube to external factors. The moisturizer can be used under makeup but make sure to let it get absorbed by the skin first. Applying your makeup while it is still wet can affect the finish you’ll get from it. Lavo Daily Moisturizer Cream has a natural light blue tint but don’t let it make you underestimate its benefits. It has a non-greasy botanical based formulation to control oil, fight bacteria and provide your skin with a great amount of hydration. The moisturizer leaves a matte finish on the skin which makes it perfect to use as a makeup base. It’s suitable for both men and women, too. In terms of ingredients, this one is jam-packed with components your skin will surely love. Aside from having hyaluronic acid, it also has vitamins A, B, C and D.
It also has Aloe Vera and Chamomile extract to soothe any inflammation your skin has. You can use it twice a day to get better effects. This moisturizer has the ability to decrease the appearance of fine lines and wrinkles- an added benefit you’ll surely have a hard time resisting. These things can make you all fretful about applying moisturizer on your skin. And that’s completely understandable. Unfortunately, however, moisturizers are an essential skin care item that shouldn’t be out of your routine. If you deny your skin the moisture it needs, it will only make things worse. And by worse, I mean, more oil. When you have oily skin, your tendency is to use products that can take away the grease and shine on your skin. Although it can help address your present concern, it can actually be more harmful in the long run. When your skin senses that there isn’t enough moisture on its surface, it’s tendency is to compensate. It will increase its production of oil and, as a result, you have more grease and shine to worry about. To solve this concern, you need to find a moisturizer that can hydrate your skin without adding oils. Skip products that contain lanolin, petroleum and cocoa butter and, instead, pick ones that have hyaluronic acid, glycerin and aloe. These ingredients can seal in moisture in your skin without triggering it to produce more oil. Oily skin isn’t really that difficult to care for. You just have to know the right products as well as how you can use them for your advantage. It may sound a bit complicated but, trust me, it really isn’t. Let me break things down for you in 4 simple points. This is probably one of the biggest and most common errors of people with oily skin. If you tend to skip moisturizers because you are afraid to feel like a huge grease ball, it’s time to rethink your skin care routine. For oily skin, pick a moisturizer that’s not cream-based. It should be non comedogenic to limit your chances of developing acne as well. Moisturizers don’t have to be thick to be considered effective. Remember, it’s not always about the texture but the ingredients inside the product. You also don’t have to slather too much moisturizer on your skin. Apply only what’s necessary to avoid choking your skin. Exfoliating oily skin is as tricky as moisturizing it. Overdo it and you can end up with overactive oil production. For starters, try exfoliating once a week. Skip the abrasive exfoliators since they can be damaging to the skin. Makeup can boost your confidence but it can also spell trouble on your skin, particularly if you pick the wrong formulation. To stay on the safe side, wear as less makeup as possible. If wearing cosmetics is inevitable, remember to take it off at night before you hit your bed. Oily skin doesn’t readily cause breakouts but if you let your pores get clogged, you can end up with a really bad case of acne. Asking your friends about how they control oil can be reassuring but there’s no complete guarantee that what they do will work for you. This makes it important that you develop a skin care routine that can address your skin’s specific needs. Oily skin can make you feel conscious about the way you look. If you are in the middle of a presentation or an important event, it can lower your self-esteem and affect the way you interact with people. Because we understand the negative sides of having oily skin, we’re presenting you with a good solution. 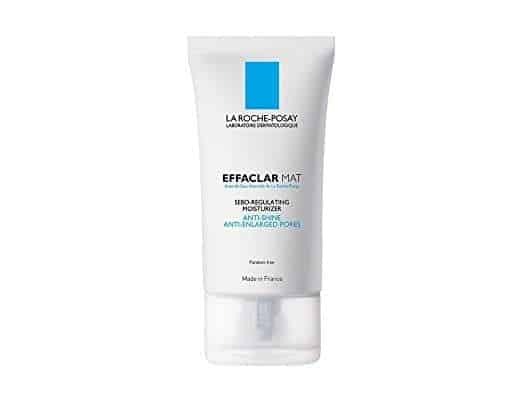 Our pick as the best moisturizer for oily skin is La Roche-Posay Effaclar Mat Oil-Free Mattifying Moisturizer.